The phrase “slip and fall claim” aptly describes situations where a visitor falls and injures him or herself because of a hazard ignored by a land or business owner. It is simply a particular type of negligence claim. The injured party in a slip and fall case is entitled to pursue money damages against the responsible party for its negligence. If you have sustained a slip and fall injury, the Raleigh personal injury litigation lawyers of Maginnis Law can help with your case. For a free evaluation, contact one of our attorneys at 919.480.8526 or email us using our contact page. 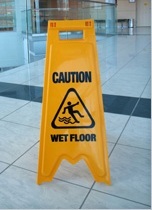 Slip and fall claims can arise in any number of ways. Classic examples include plaintiffs injured by a department store’s negligent failure to clean up water from a slick floor or by an apartment complex’s failure to put salt on iced-over stairways. If the facts of your situation would arguably support a slip and fall claim, you should consult an attorney for a professional evaluation. The damages recoverable in a slip and fall case depend upon the particular facts. Assuming liability for the slip and fall injury can be proven, the following types of damages may be recoverable: (1) medical expenses; (2) lost wages; and (3) pain and suffering. If you have sustained any permanent disability, there may be additional damages available. Finally, if the defendant’s conduct amounted to willful, wanton, or gross negligence, punitive damages may also be awarded. The Raleigh slip and fall attorneys of Maginnis Law provide free consultations for all personal injury claims. Our billing arrangement for slip and fall claims is based upon a contingency fee. This means that you are not responsible for attorneys’ fees unless you recover damages for your slip and fall injuries. Maginnis Law is a Raleigh civil litigation law firm servicing Raleigh, Durham, Cary, Chapel Hill, Apex, Wake Forest, Morrisville, and the rest of the Triangle. You may call one of our Raleigh lawyers directly at 919.480.8526. Confidential email inquiries may be sent utilizing our contact page. We will usually be able to answer any questions the same day.